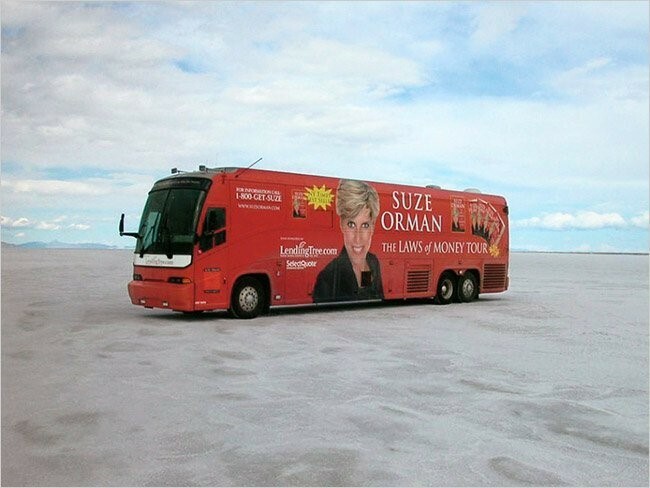 Suze's walk down memory lane was originally posted by The New York Times in 2009. Consumer spending may be down, but desire apparently isn’t. Americans still want, they crave, they have to have. They want $8,000 sewing machines and $2,800 custom closets and $5,000 minitractors, and sometimes they reach out to Suze Orman, the ubiquitous, telegenic personal-finance expert and beg her for permission to indulge. Early in March, a woman called into “The Suze Orman Show,” one of CNBC’s top draws, and told Orman that she wanted to build an outdoor kitchen. The cost: $3,000 to $5,000. Orman, sitting in the CNBC studio in Englewood Cliffs, N.J., expressed some skepticism. The name of this particular segment of the show is “Can I Afford It?” but Orman often plays it as “Give Me a Good Reason Why You Need It.” She scowled. “Why can’t you just have a barbecue outside for, like, 150 bucks?” she wanted to know. On her show, Orman often takes on the role of the family killjoy, a figure most infuriating when her logic is irrefutable. The caller ran some numbers by Orman — her household had $30,500 in savings, which Orman seemed to think was scant, plus a car loan, a home-equity loan and a mortgage — but Orman granted economic absolution. “You have been approved,” she announced. This was a surprise. “What?” someone in the control room said, shocked. Orman, a virulent antidebt crusader, typically withholds her approval in such cases. But she quickly returned to form. She heard next from a new mother who wanted to spend $2,000 on laser hair-removal. Orman and the woman went through a quick rundown of the numbers, including the woman’s roughly $7,000 in combined monthly income. The caller hedged. That was all Orman needed to hear. Denied. The “Can I Afford It?” segment has always generated thousands of requests for Orman’s counsel. But since the early fall of last year, the number of requests has gone up “exponentially,” according to the show’s executive producer, Amy Feller. The career of any financial adviser thrives on worry, and Orman, already the best-known financial adviser in the country, has hit the worry motherlode. In January, “Suze Orman’s 2009 Action Plan,” a guide to the economic crisis, made the best-seller list. Around the same time, Oprah Winfrey began giving the book away free in digital form on her Web site. (After Winfrey announced the offer, the book was downloaded more than two million times in one week.) Overall viewership on “The Suze Orman Show” is up 22 percent from this time last year, and the urgency of the calls has increased, too. Instead of asking about what kind of mortgage makes the most sense, her viewers are calling with questions of survival like, If I have to default on one of my various lines of debt, which one should I abandon first? With the change in the economic climate, Orman’s role in the culture has shifted from pop finance guru to something more like a trusted national adviser. Along with Winfrey, television personalities like Matt Lauer, Anderson Cooper and Larry King regularly turn to her to make sense of the economy for their viewers. Recently even the United States government has sought her help. When the F.D.I.C. decided to run a public-service announcement reassuring Americans that their bank deposits were insured, it asked Orman to appear in the spot. In the ad, Orman delivers the message, followed by only a brief appearance by the F.D.I.C. chairwoman, Sheila Bair. Orman asks, “Who cares more about your money than you, me and the F.D.I.C. ?” She wasn’t paid for the work, but it’s hard to imagine better promotion: “You, me and the F.D.I.C.” — there was Orman, snugly situated between everyman and the federal government. Orman has been propelled to fame not by her financial success, or because of any revolutionary insight about, say, index funds. Rather, she has figured out a way to channel an innate charisma and a televangelist’s intensity into an otherwise bland message of fiscal responsibility. She could recite the phone book with her broad, Midwestern accent, her repetitive rhetorical flourishes, her interjections of “Are you kidding?” and people would still sit up and listen. There’s as much Joan Rivers in her delivery as there is Deepak Chopra, and somehow, in Orman, neither part makes the other look ridiculous. “My goodness, Suze!” said a woman who happened to be entering the building at the same time as Orman. “It’s wonderful to meet you!” She explained that she had read all of Orman’s books and was heading to work as a travel agent for CBS. “Good at what you do?” Orman asked. 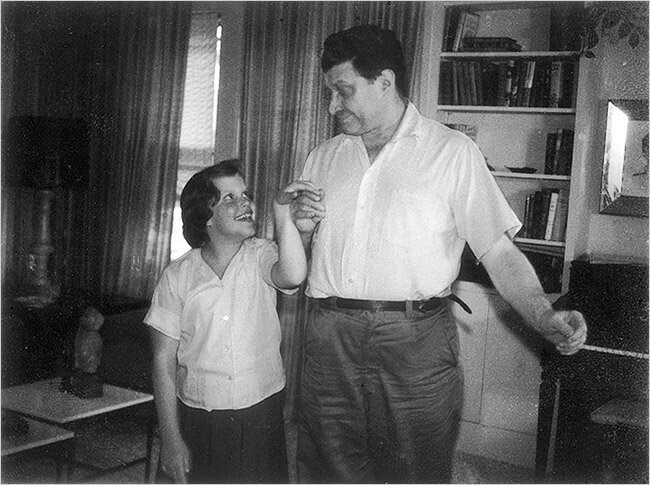 “That’s my girl!” Orman said and waltzed onward. 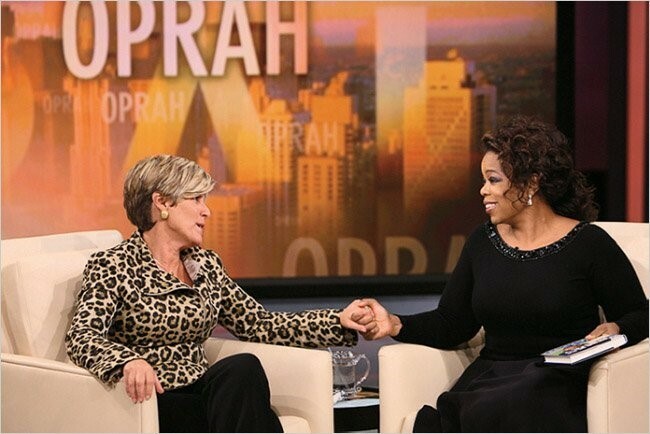 Beloved for these tough-love dressings-down, which Oprah calls “Suze smackdowns,” Orman says she actually never genuinely loses her patience but “acts it up for television.” Her real wrath, she says, is saved for the people in charge who let all those mortgages go through. But if that’s true, since the meltdown she has given an Academy-Award-worthy performance of someone truly peeved by the financial recklessness of average Americans. On “Oprah” on Sept. 23, an episode that was shot near the peak of the credit crisis, Orman unleashed her fury on a couple featured on the show who had no health insurance, a home that was worth less than what they owed on it, had endured a layoff and were living off of 29 credit cards. Orman’s syntax was starting to get bollixed up as she worked herself into a frenzy of indignation, letting the couple know it was high time they sold their home: “The fact that you were never late on those credit cards because you were borrowing money from credit cards to pay other credit cards to pay your mortgage. . . . ” She raged on and on. When the wife tried to defend her behavior, Orman dismissed her arguments. “You are talking to Suze Orman here!” she said. Orman, who is 57, estimates her net worth at about $20 million (though even a cursory look at the numbers suggests she is worth much more than that). But like so many great evangelists, she herself was once a fallen woman, a lost soul in what would become her area of spiritual expertise. Someone channel-surfing who caught an earful of Orman scolding a debt-ridden wretch might hold her judgmental tone against her. But the devoted readers of her books and her regular fans on “Oprah” and QVC, where she hawks the books and other products, feel that they’re hearing the zeal of the convert, the compassion of a sister who has been there. 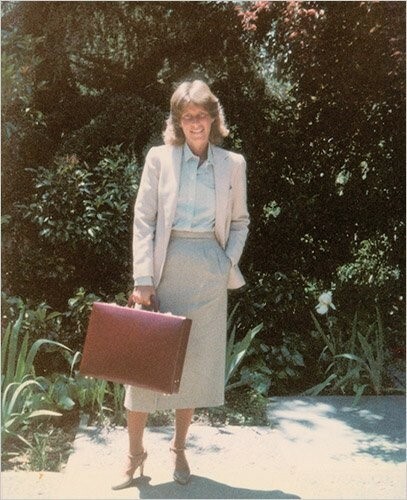 Orman began her career as a stockbroker in 1980 and then started her own financial-planning firm in 1987. She went into serious debt after she had a professional meltdown, a crisis of confidence that she suffered, she has written, after she was sabotaged by a former assistant. “I had $60,000 on my Amex alone,” she told me. She estimates that she had yet another $60,000 to $70,000 in additional credit-card debt, had mortgaged her small home to the hilt and was driving a leased BMW that required upward of $600 in monthly payments. She dipped into her 401(k), an action she currently deems a financial cardinal sin, to pay for a $7,500 Cartier Panther watch, which she wore to impress a wealthy woman she was dating at the time. As is often the case in the anecdotes that fill Orman’s best-selling personal-finance books (she has written nine of them), personal change started with a profound revelation followed by a drastic course of action. Sitting at a diner one evening, her Cartier watch on her wrist, she realized that the waitress probably had more money than she did. “I knew I was nothing more than one financial liar, and that nobody had a clue what was going on behind the financial mask,” she told me. “If I was going to turn my life around, I had to do it with honesty.” She started calling her closest friends and, like an addict in recovery, confessed to one after the other the truth of her situation. The story also appears in the introduction to her third book, “The Courage to Be Rich,” which is effectively a parable about how those who respect money — who are generous but not careless with it — are rewarded with more of it. Orman writes and talks about money as if it were the fruit not just of industry, but also of honesty and charity; as if some almighty bestower of wealth kept tabs on who was naughty and who was nice. Something about the formula resonated with readers: the book, the most successful of Orman’s, has sold more than three million copies. Orman is now wealthy enough to support (presumably with great humility) her 94-year-old mother in Florida in grand style, but until she was close to 30, she usually had only just enough to get by. Her father, who raised his family on the South Side of Chicago, ran a takeout-chicken stand, bringing in far less income than most of the parents of the kids in Orman’s mostly Jewish, upper-middle-class crowd. At 29, when Orman was working as a waitress in Berkeley, Calif., a group of regulars raised $50,000 for her to open a restaurant, a dream she had confessed to one or two of them. On the advice of a stockbroker from Merrill Lynch, she invested the money, and she promptly watched it evaporate. Convinced that if her lousy stockbroker could get a job at Merrill Lynch, she could, too, she talked her way into a job there. The way Orman spends her own money seems to reflect experience with both poverty and great wealth. Extravagance and frugality run up against each other. With her partner, Kathy Travis, she bought an apartment at the Plaza in Manhattan in late 2007 — paying top dollar near the peak of the market — but their apartment is in other respects quite modest: a 1,275-square-foot one-bedroom in which they installed a Murphy bed. She owns a compact condo in Florida that is on the beach, but when she and Travis host a large family Thanksgiving every year, there aren’t enough beds for all the relatives. “They sleep on AeroBeds,” Orman explains. Even one of Orman’s trademark stories about learning to be frugal — the anecdote of the Cartier watch — ends with an extravagant gesture. What did she ultimately do with the watch? When she started making money again, Orman told me: “Every time I looked at that watch, it reminded me of my stupidity and how powerless I was, and how I was doing things for the wrong reasons. I didn’t want it around me. I didn’t care that it had doubled in value. I was at a friend’s house one day, and she was admiring the watch, and I took it off and said, ‘Here, it’s yours.’ Just a friend. ‘Here, you take it.’ ” To a typical financial adviser, that might look like throwing money away — a lot of it. For Orman, it was a gesture of pure liberation, the cleansing of an unhealthy relationship to money. That same extravagant streak showed up in a relationship more recently. Eight years ago, when she first sensed that Travis was the right woman, Orman had her longtime driver meet Travis at the airport in a car filled with gardenias, Travis’s favorite flower. Not long after Travis arrived home, the doorbell rang: a deliveryman with an armful of Casablanca lilies wanted to know where the rest of the flowers in his truck should go. It turned out that Orman had purchased the entire contents of a flower shop. Orman is nothing if not a contradictory personality — someone who travels with her own healthful, organic food but who also rewards herself, after a day in which she has sold $1 million worth of her books or financial-planning kits on QVC, with a binge at Taco Bell. Karen Fonner, who works with Orman at QVC, recalls that at the end of a workday about eight years ago Orman told her that she craved a hot dog. Fonner took her to a hot-dog stand and watched — everyone in the vicinity watched — as Orman devoured six hot dogs. Appetite is something Orman understands, and that may be what her viewers intuitively appreciate as she mocks them on air for their own cravings. It’s part of what makes her censure so palatable. She made herself famous by teaching people to resist the temptations of America’s money culture — but she’s also a product of that culture and one of its more peculiar manifestations: a naturally skilled seller of stuff who sells freedom from consumerism and materialism. People who have worked with Orman for years — Julie Grau, for example, her editor at Spiegel & Grau — often say that Orman has mellowed since meeting Kathy Travis, who goes by KT. A cheery, affectionate and efficient woman a year younger than Orman, Travis has a successful past in business herself, having spent most of her career building branding divisions in Asia for Ogilvy & Mather. When Travis shows up on the set of a show where Orman is appearing, she simply introduces herself as Orman’s manager. It may not be a complete introduction, but it’s accurate. Travis does everything for Orman, from handling press requests to seeking out new business arrangements to reapplying Orman’s eyeliner and touching up her hair at photo shoots. Indirectly, sexual politics also played a part in Orman’s collaboration with the F.D.I.C. Orman first got in touch with Sheila Bair at the F.D.I.C. not to talk about a public-service announcement but because Orman had fielded questions from a viewer about how trusts were insured by the F.D.I.C., and in the course of researching the topic, she concluded that the rules discriminated against people who are gay. She made her case to Bair, who told me that over the course of her conversations with Orman, she agreed that it was a freedom-of-choice issue and the rules needed to be changed, including a restriction on the trust insurance that required that you be a “qualifying” family member for protection. “She asked, ‘Why do you dictate who people are going to leave their money to, whether it’s a gay partner or niece or close family friend?’ ” Bair said. “People should be able to make those decisions on their own.” The F.D.I.C. simplified the rules. 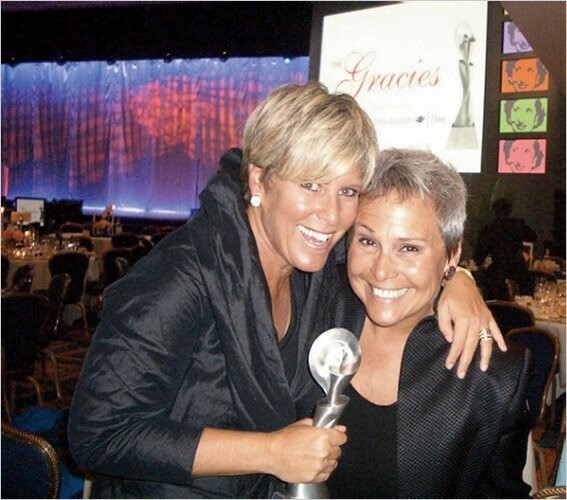 By 8:20 one morning in mid-March, a mostly female crowd attending a women’s leadership conference at Omaha’s Qwest Center knew that Suze Orman was going to start speaking in a few minutes, and dozens of them started half-running across the conference room. They were beelining it over to the Ameritrade booth, where there was a poster with Orman’s image on it. All they had to do, word had gotten around, was sign a simple pledge, and they would get a free copy of Orman’s book “Women and Money.” By signing the (nonbinding) pledge, they would be committing to following the golden rules Orman has preached since she published her first book: Reduce debt; save for retirement; respect yourself by being honest about money. “If you don’t SAVE yourself,” the language on the poster read, with Orman’s visage smiling in a serious kind of way, “who will?” The poster directed them to a Web site with the same semiapocalyptic language: Saveyourself.com. This year Ameritrade increased the investment requirement to $100 a month, and DeLaurentis said the firm doesn’t know what percentage of Save Yourself clients will continue to invest beyond the initial offer; but she said the proportion of women who sign up, wherever Orman speaks, is “incredibly high,” higher than any other offer they have. Contrast that with what Orman said to The Chicago Tribune a few years back, when she was criticized for shilling a zero-percent-interest campaign for General Motors in a television ad that ran for a few weeks. Critics charged that she was compromising her objectivity (and that she hurt her credibility by implicitly endorsing the purchase of new cars, which she, like most financial planners, characterizes as a money-losing proposition). “You think they don’t know I was paid to do the G.M. commercial?” Orman said of her viewers. “I’m not in this for charity. This is a business, and anybody who thinks that it’s not a business is an idiot.” It’s a more candid take on her motives than Travis’s, but in its no-nonsense way, it’s pitch-perfect Suze. Even as she stresses the legitimacy of her own financial self-interest, Orman takes seriously her unique position as the people’s financial planner. Sheila Bair at the F.D.I.C. told me that Orman donated hours of her own time working on a new Web site that the F.D.I.C. was creating to deliver easy information about what funds are protected. Orman regularly talks off air with callers who need more help than she is able to give them on air. Orman pressed her publisher, Grau says, to give away her “2009 Action Plan” free of charge; they compromised on charging for it after the first two weeks. She sometimes sends financial aid to people who have reached out to her, and regularly donates her time at U.S. bases overseas to advise military families on their finances. Orman has strong opinions in general. She won’t speak before many doctors’ groups, because they get on her nerves (doctors always think they know better, she says). Until recently, she didn’t like to speak at universities, because they generally don’t charge students to attend her lectures, and she says that people don’t value things they haven’t paid for. She has been reluctant to work on school curricula on personal finance, because she says students can’t learn empowerment from people who aren’t empowered, and teachers, she says, are too underpaid ever to have any real self-worth. She told me: “When you are somebody scared to death of your own life, how can you teach kids to be powerful? It’s not something in a book — it ain’t going to happen that way.” She once delivered pretty much the same message at an anniversary celebration of a private school — she seems to recall calling the school a “travesty” — and was all but escorted to the door when she was done. Not long after that, she wrote, “my father died — in his eyes a lucky man.” The point of the story: Sometimes the worst misfortune paves the way for a better opportunity. Back in March, a few minutes before Orman was about to go live on “Morning Joe,” I mentioned to her that I had been struck by the story of her father’s perseverance. Did his entrepreneurialism, I asked, inspire her? I was startled by the apparent discrepancy with her more sanguine account of her father’s death in “The Nine Steps to Financial Freedom” but let her continue. A few weeks later, I asked Orman about the seeming contradiction in facts, and she passed it off blithely, even likably. “Oh, who knows what I said in the book,” she replied. She added that she probably gave the story a happier ending in print to please her mother.